10.14.09 = Dancing shadows. I loved how the shadows of the leaves danced on the side of this bright red barn. Bright blue skies, red barns, green grass and white fences.....perfect comp for photo don't you think? Sorry I've missed posting for a few days but I've been out of town and running like a mad woman. Is it Friday yet? thats a great barn shot! Beautiful capture, contrasts and composition ! Wonderful shot..I really like how bold the colors are...very striking contrasts. The shadows on the barn are amazing! Makes me look deep into the picture and imaging how big the tree must be that is casting all those shadows! Good timing for the shot! This is a great shot, striking cotract of colors. Very nice. PS - my first 35mm was a Minolta XGM - I actually wore it out! 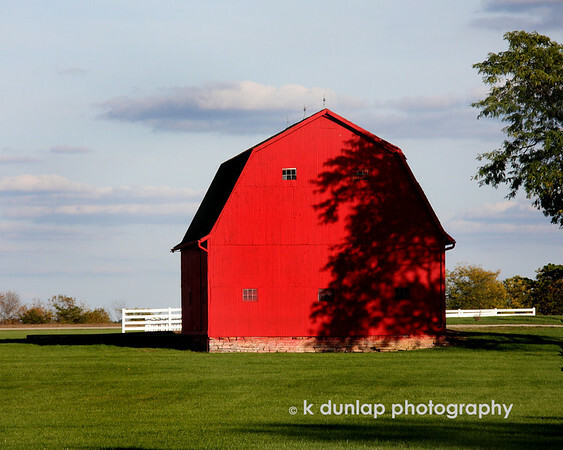 very good shot, the red on the barn really pops and the shadow creates great depth! Cool color combo here, Kris! Very nice! Beautiful picture, and great quote !